Help Documents - Version 5 Add Sales Items (Tickets)How do I set up Automatic Discounts? Discount Codes (Promo Codes) - are applied by the registrant on the registration page prior to submitting their registration. You create and distribute these codes to special registrants who will receive special pricing - discount codes can be applied to the entire order, a group of items or only one item - How do I set up Discount Codes? 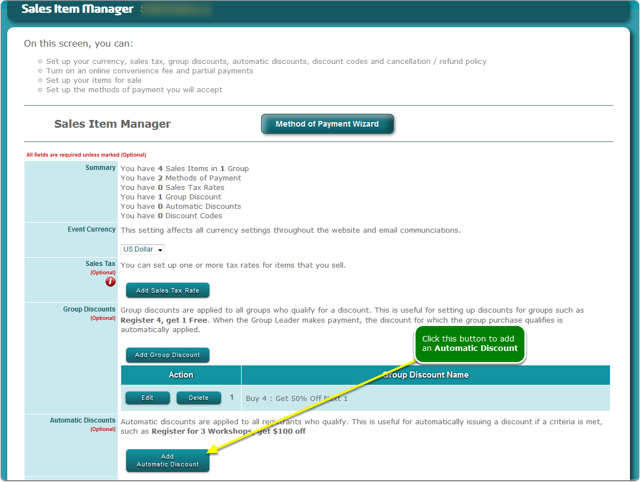 Automatic Discounts are automatically applied when a certain combination of session selections and/or sales items are purchased, a discount is applied. They can be restricted to a date range, can be a fixed dollar or a percentage discount and can be constrained to either registrant types and/or method of payment. Scroll down to the Automatic Discounts section. 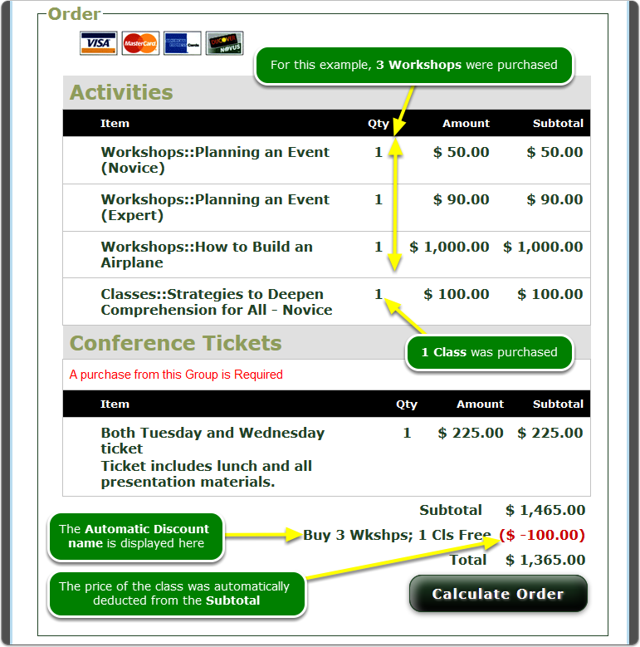 This example illustrates a simple set up: Buy 3 Workshops, Get 1 Class Free - Offer available to only Members and only during the month of August. If all of these criteria are met, the discount is applied automatically. You can set up as many Automatic Discounts as you need. They will accumulate in the Automatic Discounts table. BE CAREFUL: if you have multiple automatic discounts, be mindful of "overlapping" discounts. The general rule is: if ALL of the criteria of an automatic discount is satisfied, the discount is applied. Overlapping discounts could result in unintended multiple discounts for the same items. In no case is a discount allowed to result in a negative price. IMPORTANT: If you delete an automatic discount, there is NO affect on existing registration records (nothing is changed for existing registrants who received the discount). The automatic discount will NOT be available for registrants going forward. 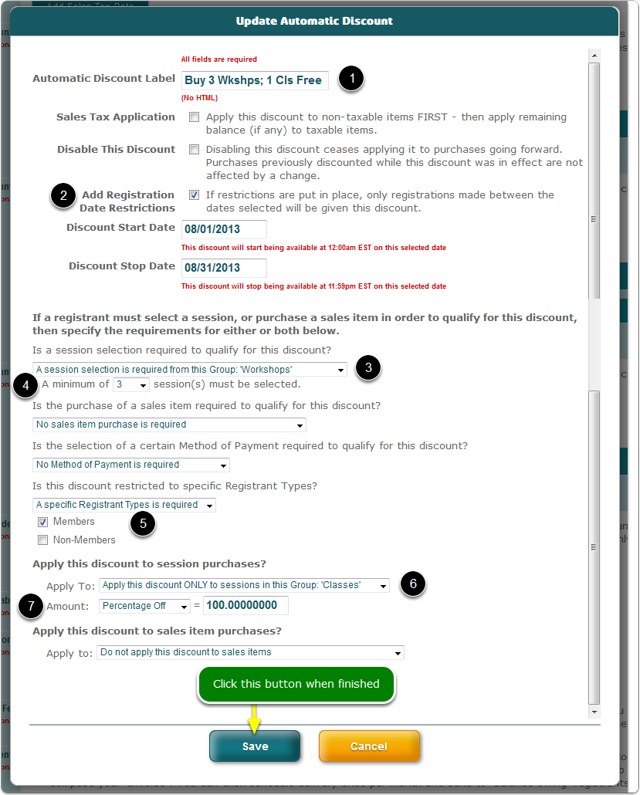 Make a test registration and "purchase" the items that you set up for each automatic discount. IMPORTANT: NEVER assume that automatic discounts will work without testing. If you have overlapping automatic discounts, then also test by purchasing the items for BOTH discounts - is the resulting price correct? Prev: How do I set up Group Discounts? Next: How do I set up Discount Codes?